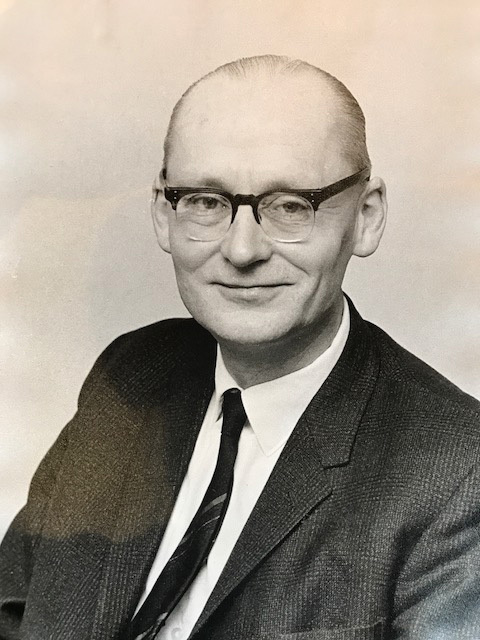 As part of the research for "BBC Engineering 1922 - 1972", John Holmes carried out a number of interviews with experienced BBC engineers. At the time, Neville Watson was Chief Engineer Television and Tom Worswick was Head of Transmission Group in Designs Department. As well as being very accomplished and knowledgeable engineers, they were extremely likeable and highly regarded people. Neville Watson Pictures taken in 1987. If you can provide better pictures then please let me know. The transcript was provided for this web site in 2006 by John Sykes, after it had been retyped by his assistant Margaret Cole. Please note that it was not originally produced for direct publication and it is somewhat unstructured, but it has deliberately been left virtually unedited in order to retain the spontaneity and enthusiasm that we would have experienced had we been in the room. I joined the BBC in February 1933 as an engineer’s assistant, and I would emphasise that this was not an assistant engineer; an engineer’s assistant was the lowest form of engineering life in the BBC at the time. I joined at a time when the Northeast of England, where I lived, and where I had been born and brought up, was in a state of extreme depression; there was an immense amount of unemployment. I had made several false starts in my career; I had done a little bit of teaching and I was then thinking of joining the Civil Service by sitting what was then called the ‘Executive Exam,’; I was in fact just about to sit this exam when an engineer who was then on the Newcastle station, a chap called French (whom we all knew as ‘Froggie’) who lived close to me at Whitley Bay, said would I be interested in joining the BBC, because he knew that I had been an enthusiastic amateur of wireless ever since I could remember – since the age of about nine or ten. I had very little basic technical knowledge, but when I got to the Newcastle station I found that it was not much less than most of the people had who were already there, except of course in terms of the actual apparatus that they were using. I stayed at Newcastle as an engineer’s assistant until about the middle of 1936, when I was promoted to improver and moved to Birmingham, where I stayed until 1938. Early in that year I was interviewed by Rantzen, who was then Head of Lines Department and a few weeks later I was offered a job as Junior Lines Engineer in that department. I was told before I joined Lines Department that my main job would be on OB’s under Eddy Woods, but in fact I did very little of that work apart from one or two jobs, because almost immediately I was transferred to work for Stuart Padel, who at that time was developing the transmission of television signals over telephone lines. I stayed in Lines Department rising in grade until the split occurred and Designs Department was set up and a new O & M Lines Department was formed. 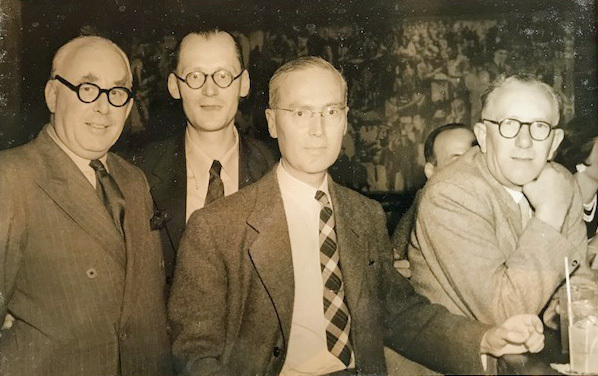 IN the later part of 1945, however, I became Head of the Television Section of Lines Department (the split did not occur until 1947: JHH), at which time my old friend and colleague Tom Worswick had gone off to SDID. The next move was the formation of the Designs and O&M Lines Departments; some people joined Designs form SDID and some left the old Lines Department to form the new O&M Lines Department. At that point I became Head of the newly formed Designs Department’s Television Transmission Section and Tom Worswick became the Head of the newly formed Studio Section; these were the only two sections dealing with television in the department, and remained so for some time. In early 1953 I was made Head of the Television Group of Designs Department, which then consisted of the two original television sections of the department, to be followed shortly by others, until in the end there were about four or five sections in the Group. I remained Head of the Television Group until 1 January 1964 when I became Head of Designs Department and in about April 1968 I transferred to become Chief Engineer, Television; a post which I still occupy. I qualified at London University in 1935 and joined the BBC as a Student Apprentice in September 1935. I spent two years doing the usual tour, and in September 1937 was posted to Alexandra Palace, which of course had been running since the previous November, as a Junior Maintenance Engineer in the studio end of it, starting off with a little bit of sound and then telecine, and then I graduated to the enormous peak of being a racks engineer. In September 1938 I was extradited from there to Lines Department to join Watson and Padel on television transmission. Chorley’s career was very similar to mine. He had been a student apprentice and went to Alexandra Palace transmitters and went to Lines Department with me in September 1938. There were thus four of us: Padel, Watson, Chorley and myself and this went on until the war. When war broke out we were posted all over the place for a short while and then we fetched up again in London on communications which I did until 1943; in the early part of that year I was posted to Bristol as Lines Engineer West. I did a year there and then went on sick leave for three months. In 1944 I came back to London specifically to start preparing for television after the war – I was supposed to take things gently at first. When the war ended I went to P & ID to join their television section preparing to start television, which must have been about mid-1945. I was there for about a year, until the formation of Designs Department. As part of that carve-up I came back to Designs Department as Head of a small section on studio apparatus at Brock House. This went on until 1953, when we all moved into Western House and the department started to expand. I was Head of the Studio Operations Section, Television until 1 January 1964 when I became Head of the Television Group. When I joined Stuart Padel on the pioneer work of the development of television transmission over telephone lines, the situation had got to the stage where a number of amplifiers had been built, powered, though it seems almost impossible to believe now, by wet accumulators which were made up in 60 volt units of enormous weight, probably about eighty pounds each. We were living at the time in an underground place in Portland Place and we had to carry these damned things up an iron stairway to the street, and of course in addition there were vast 6-volt l.t. accumulators and I think we had a few equalizers – frequency equalisers, but I think no separate phase equalisers at that time – which were amplitude correctors aimed at producing a circuit of about 2 MHz bandwidth, which we eventually achieved. Before the war none of our circuits were much wider than about 2 MHz. 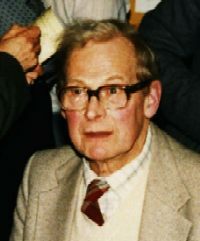 Stuart Padel had been doing this work on his own, with occasional help from other members of the department, ever since the original proposition had been made for transmission on telephone lines, either by Rantzen or by Rendall, nobody was ever sure which of them put it forward, and the controversy is, to this day, not resolved! Nor is it likely to be. The first innovation was to move over to mains operation; it was very clear to me and I was very strongly supported by Tom as soon as he arrived, that unless we got some kind of mains operation of the repeaters, which of course we had to cart into Post Office exchanges, we had little hope of doing a practical job. We did this in a very simple way; we got hold of a mechanic to work for us all the time (that was our old friend A W Brookman) and we cribbed the design of the EMI amplifiers which had been provided on the long distance balanced pair which EMI had developed and of which the Post Office had laid considerable lengths round London, including the route from Broadcasting House to Alexandra Palace, and produced our own stabilised power supplies; it was absolutely essential to maintain a very low hum level on these amplifiers as well as stability of gain. I think this was a very good design of power supply, valve stabilised of course and since those days they have been used in enormous numbers. We made up some sets of this equipment and collected some further test equipment; the test equipment in those days consisted very largely of a sine wave oscillator variable in frequency from about 60 kHz up to about 3 MHz – it was one of those big Ekco things – we had two or three of them, enormously heavy, like all our apparatus in those days. The receiving equipment consisted of a valve voltmeter by Moullin, which was a very accurate instrument – we had a lot of those, the later models being rather superior to the earlier ones, though Stuart was never really convinced that they were; he always went back to the first one that we ever had! Our method of working was essentially to take a frequency run over each particular section of the circuit that we were trying to produce. We had thus equipped ourselves with enough amplifiers and test equipment, though I don’t think we had any wave form monitors at that time and no sort of portable oscilloscopes. To measure noise we had to send it all the way to Broadcasting House and display it on a picture monitor; this was the only way because we had no appreciable extra gain in our amplifiers. One of the big struggles of the time was to find a means of going from the balanced pair on which we were working to the unbalanced amplifiers and equalisers, although some of our equalisers were built in balanced form to get the signal down in the most efficient fashion for application to the first amplifier and, I think I am right in saying, that we had repeating coils almost from the very beginning which were produced by ST&C as a result of the influence which Lines Department had with ST&C which was very considerable because as we all remember, half of the department were ex-ST&C engineers. ST&C were remarkably advanced in that kind of work; they probably knew more about it than anybody else in the world and they produced very good repeating coils, but all were deficient either in response at the highest frequencies in which we were interested or in response at the lowest frequencies, which in the case of television are very low. Not that at that time we clearly understood what was needed in the way of low and high frequency response. The first task that we were set to do was to produce a circuit from the Zoo to Broadcasting House. This was a two or three repeater job and the method of working was to take a local end, as good as we could get, i.e. as high a gauge as we could get. We used to make the Post Office scratch around to get the highest gauge conductors for us – which, if we were lucky, was sometimes a 2- lb pair, sometimes of course a 10 lb pair. The circuit went form the Zoo to the nearest local exchange, from there to Welbeck and so into Broadcasting House. So there were three repeater sections. We could get about 55-60 dB gain, which was the limit for each section. Each amplifier had a gain of about 34 dB, and at times we did attempt to set up three, of course with equalisers between them, but generally we finished up with everything in a tremendous state of oscillation! As we gained experience and looked back on the efforts we made on the Zoo circuit, we could see that we never had a chance of making it work, though it was always a favourite of the outside broadcasting unit of the time. There were two OB units, scanners as they were called, before the war. One was in existence in time for the Coronation of 1937, and the second one followed about six months later – things were done pretty quickly in those days and these were big things, essentially control rooms on wheels. We spent many weary months trying to make the Zoo circuit work, but we couldn’t; we were defeated by noise if we were defeated by nothing else; the loss on the lines was far too high and we had rather low-level sending equipment. I think in fact that we sent through a repeating coil in those days though we did eventually develop unbalanced-to-balanced sending amplifiers so that we could send a bigger voltage to line. Incidentally, during that time we were largely working on batteries; it took us a year or so to get the mains power supplies into operation. Stuart Padel had designed his equalisers in a very rigorous way by taking impedance runs by open and short circuit measurements on the paper insulated cable. In this way the equalisers were calculated and designed; he certainly calculated the phase characteristics at the same time, though whether he allowed for them in his equaliser design at that stage I don’t remember – I am pretty sure there were some delay correctors in the very earliest equalisers, but I am not sure; I think they were built in. Most of the equalisers were balanced. Rendall was very active in the design of phase correctors in those days as he had had a great deal to do with this in his earlier work on telephony in the twenties. The first real job that we did was a transmission from British Movietone News. This was a two-repeater-section job from Movietone News into Gerrard exchange and from Gerrard into Broadcasting House via Whitehall where there was a connection point to the EMI balanced pair cable. This circuit was used in late 1938 with repeaters at Gerrard and Whitehall exchanges. The television people were not at all confident that we would be able to use the cable for this transmission and the radio link was set up as well on the old Band I frequency, round about 60 MHz. To our very great surprise it was agreed that the signal sent over the cable was at least as good as the signal on the radio link and this was the way in which the circuit was set up. After that, we developed very rapidly and we did many OBs. In the main we used to set up a link into the nearest point on the balanced pair circuit, which at the same time was being extended so that it went to various places like the Empress Hall where it finally reached though our first transmission from the Empress Hall was in fact done on telephone pair. This was where our famous ‘flag pole’ signal originally came from which was the real beginning of wave form methods of testing television circuits. The flag pole was a 2 µsec pulse – and we had developed what we called the flagpole generator before the war stopped our activities. We used to set up our circuits by getting the wave shape of this testing wave form correct; that was quite a long time ago to be using wave form methods. It was during that Winter and the Spring of 1939 that we went and had a session on the Empress Hall – Fulham – Earls Court section, doing a lot of open and short circuit measurements on the cable to get our numbers right. We learned the importance of middle frequency correction on that occasion, and we made what was just a middle and low frequency corrector, variable on dials, which we call nowadays ‘Bode, but we learned the importance of that from the point of view of getting the wave shape right. We were beginning to feel the need for wave shape testing equipment and we certainly used the flag pole. It really was a flag pole and the first thing we did when we got the scanner there was to get a camera to look at this for hours at a time until we got the phase correction right. I think it was at that time that we finally plumped for the use of 7-pair 20 lb paper cable, using the middle pair for television, as being the best way to set up the local end. With that, we found that we could go up to about a mile, and we got a good circuit from the Zoo by using a 7-pair paper cable into Gulliver exchange. These were the important steps and they all happened very quickly. One interesting thing we did was to borrow a delay measuring network from ST&C. This we used at the Empress Hall to measure the delay characteristic of the whole circuit back to Broadcasting House, but it showed us nothing. Either the amounts of delay distortion that we thought were significant were smaller than we were taking account of or the equipment was not sensitive enough to measure the delay characteristic. At any rate, the whole thing was completely abortive. It was enormous equipment consisting of a couple of approximately 6 foot 6inches at each end and cost a tremendous effort to get into place. It showed us nothing at all so this pushed us really hard along the road to looking at wave forms rather than trying to measure steady state characteristics, although we did continue the technique of steady state measurements on the amplitude characteristics. It wasn’t until after the war that we developed delay measuring apparatus sensitive enough to be of any significance. The ‘noise coil’ appeared quite early on during the zoo tests. This was the longitudinal stop coil consisting of a balanced transformer of which one winding was put in each leg so that it had little or no negligible impedance of circulating currents, whilst presenting a substantial impedance to the longitudinal noise currents. In particular, we used to get a lot of broadcasting transmitter pick-up, right in the middle of our band. In fact that was the main thing against which we were trying to protect ourselves – this again, was one of Rendall’s developments and very effective it was too. Finally, by the time war broke out we were pretty well equipped; we had actually got picture monitors. These were the very first of the Pye 9 inch receivers which appeared on the market using a series of vales, the Mullard red ‘E; valves, which most people have forgotten about. The pre-cursors of the EF50 type of valve. We had two or three of these by the time the war began and also oscilloscopes on which we could observe wave forms, made by Mullards. We used to take a considerable amount of equipment into exchanges by the time we had to stop and, of course, the excitement of our visit to an exchange was enormous. We would practically stop everything because in those days very few people had ever seen television and the fact that you could see the pictures going through was something that attracted very large audiences – unofficially! There was always a slight difficulty about getting into exchanges; the Post Office were not too keen on the way we used to invade them, except of course for the chaps on the ground who were absolutely roaring keen to have us. I forget how many OBs we did during that short period but it must have been easily of the order of 80 or 90. All this was done at an extremely low cost, though some of the things were not cheap. If you wanted an amplifier from EMI in those days the one that they put on the balanced pairs, they were in my recollection about £80 which, for an amplifier of about 35 dB gain, was a considerable sum of money which is why we went off and made our own which were made at very much lower cost than that. We spent a lot of experimental time during that period trying to make decent valve type balanced-to-unbalanced and unbalanced-to-balanced devices; we succeeded in getting not a bad one for going from unbalanced to balanced but we didn’t really succeed in making anything with a decent noise performance in the other direction. We continued to use repeating coils until after the war. We did, however, have all sorts of wave form correctors by this time and we could do very reasonable jobs. In the amplifiers we used N34 valves; this was the output valve and there was also the Z31. These were extremely good valves, big, bulky things with rather large capacitances and the like, but enormous values of gm; the N34 had a gm of 12½ mA/volt. They were special valves developed by EMI for television purposes. Television, in fact, brought on the development of valves at a tremendous rate. Such valves were enormously extravagant in their consumption of power. They had 13 volt heaters at 0.6 amp and there was a bigger one still which took 1 amp. The plate voltages had to be 300 volts with standing current of the order of 30 or 40 mA to get the high values of gm. The big valve (numbered, I think, 834 or 854) had a gm of about 15-16 mA/volt, and the standing plate current was about 50 mA. I don’t think many valves with greater values of mutual conductance, apart from very special ones, were ever available, and these lasted a very long time – highly reliable devices. One interesting thing, which hardly anyone will remember, was that J M Chorley was constructing, immediately before we had to drop everything in 1939, what people called a time equaliser in pre-war days. That is, an echo wave form corrector. This was the thing that Dr N W Lewis developed soon after the war. We were actually constructing one on a great big breadboard with lots of big variable condensers, 0 – 500 µF. We were also preparing at that time to use the ST&C co-axial cable which existed between Broadcasting House and Alexandra Palace. This was a 0.5 inch diameter coaxial cable which was laid prior to the balanced pair as soon as television started, under pressure from Rantzen, between Broadcasting House and Alexandra Palace. It was equipped with ST&C modulation and demodulation sets working on vestigial sideband, frequency shifted, the lowest frequency transmitted being of the order of 200 – 300 kHz. As far as I know it was a complete flop because they never succeeded in getting it free of pattern interference which was then the great bogey of vestigial sideband transmissions. But the cable was still there and we were quite convinced that we could make it work at video frequency. We were preparing to do this and would have done it; it would have been a good transmission circuit, but of course w e just didn’t have time to finish the job and it disappeared during the war – probably blown up. I must mention that the stimulus for the development of the echo-correcting device also came from our old friend ‘the Doc’ – he was very prolific indeed in ideas just before the war (and after it too). In early 1941 we had a request to try to help the Ordnance people who had a gunnery radar station in Hyde Park and wanted to repeat the information in their gun control centre in what was, and still is, the Old Brompton Road tube station and they needed a wide band circuit. They had heard vaguely, through Ray Calvert, that we knew all about this sort of thing. The equipment that we had had all been packed up and sent into the country, but we fetched it back in great haste, set it all going again and we had an army of men digging a trench across Hyde Park to put in a 7-pair paper cable down to Brompton Road. We set up a video circuit from the gun station to Brompton Road. How long it stayed there we don’t know, but we never saw the equipment back! After the war of course we had to start all over again. The post-war history was that we were slightly optimistic that we would be allowed to take up the task where we had dropped it in 1939. Tom, in particular, was the main instrument, he set to work to design and produce repeater equipment in considerable quantities based, substantially, on what we had done before the war – we didn’t do any particular technical developments at that time. We set up demonstration circuits, quite a long loop around London. By that time we had a lab in Broadcasting House on the ground floor looking out on to Portland Place where we stayed for many years in what, ultimately, became the switching centre. We built a great deal of apparatus, and were ready to do the task when the Post Office decided that from now on they would undertake this task. They set to work to design their own equipment and, since that day, they have continued to do the job providing temporary balanced pair circuits, but of course in parallel the work of providing equipment for use on specially rented balanced pair circuits from the Post Office, private wires in fact, has developed continuously and is still, I imagine underdevelopment to some degree. We do still use quite a bit of balanced pair transmission in various parts of the country on permanent circuits, plus of course the Post Office activity on the temporary circuits which are used for OBs, I suppose on the same scale as it always has been. The old EMI balanced pair was abandoned when 625 line television replaced 405 line on the grounds that its reflection characteristics were not adequate for 625 line transmission. Although it was a wonderful cable, it was not as good, as you can imagine, at 5 MHz as at 3 MHz, and it has been replaced, as you know, by a network of co-axial cables which grew up in parallel with the balanced pair cable since the war. When war broke out, we were both dispersed to Daventry, but in late 1939 we came back to Lines Department, Tom and I and after one or two ‘individual jobs’, we teamed up together again and proceeded to develop a communication system for the BBC, telephone and telegraph. The first carrier system that we set up was a London-Bristol one, using music circuits. This was a very crude system, which, in fact transmitted the carrier. It was very straightforward but gave very poor results because there was not sufficient bandwidth. We were, however, then directed by ‘the Doc’ (Rendall) to turn our attention to proper devices such as suppressed carrier and ring modulators, and to design the filters properly – I remember spending quite a long time learning how to design filters under the instruction of the Doc. I learned how to do it, but our major difficulty was getting coils, and this continued throughout the whole war. We used to screw some out of ST&C who made beautiful inductors, but there were always far fewer than we needed. We had an amazing collection of these coils, but we often had to adjust the design of the filter to suit the coils that we had. The same applied to the capacitors and we used to have to make up the values from the various values that were available. The first proper carrier system was a London – Bristol, which had a normal voice circuit using the audio part of the spectrum up to about 2700 Hz. At about 2500 Hz was placed a telegraph circuit and there was a suppressed carrier voice channel above that – the carrier was round about 5000 Hz; I think we had 22 mH loaded circuits to Bristol. We then went on from that to design the Wood Norton system. This we thought was a very superior design. The telegraph channels on these systems worked, at the receiving end, on a converter that we had designed using AL60 valves in the output circuit, driving the receiving magnet directly. It must have had terrible distortion built into it because we had no telegraph distortion measuring apparatus during the war, and in fact it was some time after the war before we got any. This converter, however, went on for a long time being used. The Wood Norton system was a much more ‘civilised’ design. This again was a 1 + 1 system with one teleprinter channel, but all these teleprinter channels transmitted on the ‘tone space’ principle, rather than ‘tone mark’. By this time we had also improved the ringer panel. The RR/2 panel had a triode valve, and this was changed in the RR/3 to a pentode, which did a lot of good. At about that time we set up a weird teleprinter circuit to Manchester. This operated on dc phantoms on two separate routes as far as Birmingham. At Birmingham it went on to a tone system. We had one music circuit to Birmingham, unrepeatered all the way, which carried one leg and the other leg went round via Daventry and Northampton where there was a small communications centre for emergency switching at the Northampton Group ‘H’ transmitter. We put in another carrier between London and Leeds which was extended to Manchester two-wire, with a good balancing network at Leeds. Later we replaced the Manchester – Leeds section with a two band system. This system, too, was a 1+1 system, there being only the original 22 mH loaded circuits from London to Leeds on which to work it (these were the first underground SB circuits, repeatered at Fenny Stratford and Derby). One channel was used for Engineering control and the other for London – Manchester PBX. Referring to Caversham communications, there were two switchboards in London which at first had to be set up manually in order to direct the incoming material from the Caversham end to the desired selection of recipients at the London end. This duty, which involved manning the switchboards day and night, fell to the lot of the Lines Department duty engineers who strongly protested that this was not a duty on which engineers ought to waste their skills. This protest turned into what was the very first staff association case and was taken up by the very weak embryo wartime association. It was all settled amicably in the end by led to the installation of a remote selection system controlled from Caversham over VF channels working at 250 Hz and 300 Hz below the frequency band occupied by the telegraph channels of the Post Office 4-channel telegraph system carrying the Monitoring Service material on a two-wire ‘tariff E’ circuit. Some of my time was spent in helping with various radio ‘counter measures’. I don’t remember a great deal about these, except that we made all sorts of tone devices which were variable in frequency and we had to make a number of simple oscillators. I made the first of the Wien bridge oscillators which eventually developed into the PTS/10, which was a very good oscillator and lasted a long time. The great secret of the PTS/10 was that it was put into an extremely flimsy fibre case. Everybody said that it would get broken to bits immediately, it wouldn’t last, but in fact it lasted extremely well because it looked so fragile that people took great care of it. It had, of course, a reasonable kind of frame inside it. I made all sorts of peculiar electronic devices which, in fact, were specified by the RAF – we just endeavoured to meet their requirements. I remember going down to Kingsdown on several occasions, one of them being with Rantzen, to fit these things into their system. The only reason for developing these oscillators at that time was that we simply couldn’t get hold of, or even make, the beat frequency type; they were much too elaborate. There was also a method of obliterating enemy signals (propaganda, navigational information etc.) be receiving the signals, inverting them, splitting them up into bands etc. and re-radiating them transposed or scrambled. The final thing we put in for communications during the war was a 1+2 carrier system between London and Wood Norton, in about 1944. This was mounted mostly on wooden panels and I went to Wood Norton to install it and get it working. This system, in fact, was the forerunner of the type which was adopted after the war for the post war communications system. Another scheme on which we spent a lot of time was ‘tone marking’. This was a scheme to mark the overseas programmes so that they could be identified on the air. The signals were supposed to be ‘sub-audible’, but they were not, although they were on a low frequency. I used to listen at home. The frequency was about 50 Hz at a low level of the order of about – 25dB, and experimentally we had it also on one of the domestic services. This started in about 1943. The sender was a toothed wheel which operated a contact to send out the continuous signals, driven by an electric clock motor. That part was straightforward. It was the receiver that was the great difficulty, because it had to drive a relay from this low frequency, having separated it from the music. We started off with the idea that we would use mechanical filters – this was Rantzen’s idea – and we got it to work in a sense, but every known material was used in these mechanical filters. Large numbers of headphones were torn to pieces to provide the primary parts for this equipment – there were headphones all over the department with only one earpiece working! In the end I got utterly fed up and on the QT I made an electrical filter (with huge components of course) and this worked perfectly and was actually made and put into service. The mechanical filters did work in a sense but they were nothing like as good as the electrical filter, which was a perfectly straightforward design, though it needed very large components. On television, our effort after the war were largely devoted to producing test and correction equipment in great variety. After the Post Office had assumed the responsibility for providing the temporary balanced pair circuits for television transmission we set to work to design equipment for measuring and assessing them. Amongst the test equipment that was devised, and it was a very big job, was a delay measuring set which continued to be used until very recent times when it was replaced by a commercial device from ST&C. It was, however a very precise instrument; it could measure down to about 0.01µ sec delay distortion. It employed a rw of 16 kHz, and was used to measure the delay characteristics of the first long distance circuits of the Post Office, to their chagrin I think, because many of them were not very good. It showed the irregularities in very fine detail and perhaps that was one of its failings – it showed too fine detail for the purpose which we had in mind. We also built and replaced the balanced pair equipment with modern amplifiers and wave form correctors, amongst which were the 2- µsec bar, 50- µsec bar etc. In fact we always measured the circuit in the first place by the continuous wave method – the amplitude characteristic not, generally speaking, the delay characteristic because we didn’t think it was profitable to do that – and, having got the amplitude characteristic reasonably right, we used to observe the performance on the wave form and correct it with various kinds of corrector, amongst which were variable delay correctors and the Bode equalizer. The Post office were also developing methods of wave form correction which, I think, came a little later. Rather to my regret, we did not resume any attempt at making echo type correctors after the war, largely I think, because we got on so well with the Bode. I am not sure even today that they aren’t the most powerful of all the correctors that we possess. That, together with delay correctors, was sufficient to give us very good circuits. Itemising the equipment with which we were concerned at that time: there was the test signal generator TVTG/1, which was a very advanced generator for that time, the wave form monitor to display it, the type ‘B’ wave form monitor. We did our own wide band oscillator and there was a range of video distribution amplifiers, pulse distribution amplifiers and the first of the stabilising amplifiers, with the same technique that we still use. In parallel with all that there was, of course, the development of the SB system for television. We set up the London switching centre and then the Birmingham switching centre. By the time the Manchester switching centre was set up I think I had rather left that work and P and ID had taken it over. We did establish the technique of switching centres which, looking back, may not have been wholly desirable, but was the only practical thing to do at the time because the existing control rooms and the like manifested a complete lack of interest in the spread of television in the early fifties – people were not at all keen to provide any space in which we could work. I remember going to Birmingham and spending some weeks trying to find somewhere outside Broad Street where we could actually work because there was no space in Broad Street that could be spared. Eventually space was found near the bottom of the spiral staircase at Broad Street and I think it is there still, although it is soon going to Pebble Mill. We made all sorts of switch panels, monitoring devices etc. This was all in the period before 1953, largely transmission stuff and we were handing over the operational side from the time at which Designs Department was formed. During this period, one of the first things we did was the super-emitron camera – EMI were doing the cps – which we took as far as a complete working camera and we took it to Lime Grove where it was used for a period, but it was then discarded (perhaps a wrong decision). While we were in Brook House, we developed the inlay and overlay technique on black and white. Also we did quite a bit of work on synchronisation of sources because we could see the coronation coming up , and similar things like that, which looked as if they would have an infinitude of sources, all to be synchronised. We produced the original manually controlled lock-up synchronised system which was used for the coronation and the naval review etc. This depended on sending a locking tone at line frequency (we had provision for dividing this tone down from 10 kHz, but in fact we were able to get lines that would transmit this frequency so it was never used. We were also getting mixed up with television feeling its feet by trying to do things like the boat Race – both our groups (of Designs Department: Transmission and Studio Equipment) went to do the Boat Race. We did the boat end and Watson did the receiving end, sitting up on the roof of Harrods among the pigeons, working very hard with the Post Office on the dreadful balanced pair circuit which connected the boat Race together. There were no available centimetric links at that time and we used the most awful collection of balanced pair circuits provided by the Post Office. This brings us up to the Coronation for which we did a great many things. In fact most of the Department seemed to be working for the coronation. After that we started the real development work in television and amongst the items was the UHF starter link for OBs which was S H Padel’s work. There was the 1+1 carrier system over the 1 inch tubes which existed between Crystal Palace and Broadcasting House. The UHF starter link was necessary because at the time we could raise a UHF aerial well up into the sky on our fire escape but its principal advantage was that it was not dependent on an optically clear path between the transmitter and the receiver and we could, in fact, get round obstacles provided that they were not too large. Also, one could develop a lot of power at UHF in those days, which was not available at higher frequencies. My recollection is that from the transmitter itself there was a power of about 20 watts and we made an amplifier to take it up to 100 watts, though I think these powers were not always reached. This was of course for 405 line transmission and was a pioneering effort, using triode valves. You could expect to go to an OB site, stick your aerial up into the sky and get the transmission back to the next repeater point or alternatively, and often, straight back to Swain’s Lane where there was a receiving station. At the same time centimetric links were being developed for the longer hops; they came in in the very late forties from Marconi – they were always a commercial development over the years, and had really nothing to do with Designs Department as such. The 1+1 carrier system was developed to exploit the large bandwidth that was available on the 1 inch co-axial tubes that had been laid between Crystal Palace and Broadcasting House. It was cheaper to get a 1 inch co-axial with two circuits on it than to rent from the Post Office because we believed at that time that we couldn’t use ⅜ inch co-axials over that distance and I don’t think we can even now – it is too far. Other 1 inch co-axials were put in from Broadcasting House to Alexandra Palace, but all the cables to the television centre are ⅜ inch. We never did carrier transmission over the Broadcasting House Alexandra Palace cables. The carrier system was also used in the Bristol area for the short junction cables between the Post Office and the switching centre. This system was developed in the end so as to be capable of being used in either direction, but this was never exploited, except between Broadcasting House and Television Centre. OBs come in through Crystal Palace, I think, at video frequency on one of the 1 inch tubes. We are, of course, talking of 405 line transmissions for which the 1+1 carrier system was specifically designed. We also developed the 16 mm suppressed field recording system, which was the eventual outcome of the work on the Kemp-Duddington proposals. The Kemp-Duddington system had a peculiar sequence of pull-down and exposure in order not to lose any information and to try to give the interlace. It was quite sound in that respect; the difficulty lay in the optics, which meant that we were trying to match two frames, each with a slight amount of ‘keystone’ on them, in opposite directions and in the corners you inevitably got a flicker. To get this exactly right the best man to ask is Bliss. Eventually the system just could not be got to go because of this fundamental instrumentation difficulty, so we decided to scrap it and go in for suppressed field recording, which we did and we recorded the whole coronation, with slight gaps to re-load because there was only one machine. The reloading was in fact done very quickly and only the odd minute was lost, this all being done in Western House. Its competitor at that time was the Mechau 35 mm recording system, developed by P& ID. We also developed the telecine Mechau, also in Western House. We took the old Mechau movement and made it into an up-to-date flying spot telecine. Quite a number of these were used for a long time. They had the big advantage that they could start from rest; you could have the picture still and you could run it up in vision to its normal full speed. They were regarded as quite a useful operational facility; they had a slight flicker, but were not too bad. At this time, too, we produced some black and white slide scanners for transmitting stations for breakdown captions. This was a cheap slide scanner, it had to go on one bay and had to cost less than £1000. There was also a big development in the transmission-type receiver, which was the first 405 line receiver. It was developed prior to 1953 and was a very good receiver, the REC-3, for picking up a transmitter for rebroadcasting purposes. Many hundreds of them were made and that was subsequently replaced by another 405 line design, the RC-4, of which also many hundreds have been made. This was an interesting period, when we set up the reserve reception facilities at places like Sutton Coldfield and Wenvoe, using these receivers. There was a tremendous amount of work involved, building huge co-axial filters and the like to remove the adjacent channel of the high power station. Those arrangements are still in existence as 405 line reserves. From 1956 onwards, we began to work up to the Television Centre and a new family of studio amplifiers was produced. We began to get mixed up with the studio mixing equipment which up to then had been a P&ID activity. In fact we did the mixers for the centre. In 1959 we started a conscious transition to semi-conductors in video working. We were waiting for the transistor and when it came we went hell for leather for it. In fact we managed to get some transistor amplifiers into the Centre just before it opened. (S N Watson: We carefully avoided ever using point-contact transistors because we felt that they were so unreliable in their characteristics, and of course were quite right. It wasn’t until the junction transistor came along that the transistor was exploitable for professional equipment). We had a continuing effort, which still goes on now, in the field of measuring equipment. It is perhaps not necessary to detail it; it is just a continuing process which is tending towards the complete automatic control of the distribution system. The proposal to use a sine-squared pulse and bar around which was evolved the K-rating system was Dr Lewis’s of the Post Office and he produced apparatus in the first place that gave this kind of signal and he brought it along to the BBC to Designs Department and suggested that we should assist him in establishing the subjective picture quality which corresponded with particular K-ratings. We went through a long series of subjective tests, largely concerned with the visibility of echoes on which the whole system is rated, and established, to his satisfaction (and he wasn’t a man who was easily satisfied), that he could proceed from there on and produce the ratings for all the parameters in which we were interested. We took this up with great enthusiasm because at that time, although we were using wave-form testing methods, we had evolved no systematic measuring system around them all; we just tried to get them as good as possible on any particular circuit rather than to say “That corresponds to a particular degradation of the picture” which that circuit will transmit. We built practical apparatus; indeed we spent a lot of time involving pulse and bar generators and we pushed it all over the BBC and, eventually, all over the broadcasting world. It is now registered in the CCI as one of the standard testing methods – not universal yet, but I think people are gradually coming round to adopting it. It takes a tremendous time, when you think that Dr Lewis thought of the idea in the early fifties. Now of course there are colour pulse and bar wave-forms and I think it will become universal and have a very long life. Even the German Post Office is coming round to thinking of using it, rather than the bar edge on which they founded a measurement system, without in fact doing any subjective tests relating to the waveform distortion to picture quality; indeed they adopted the K rating limits devised by the British Post Office for the sine-squared pulse and applied them directly to the response of the bar edge whereas in fact for equivalent picture degradation the distortions on the bar edge should be approximately one half of those applicable to the sine-squared pulse in respect particularly of overshoots. The development of this testing method occupied the Measurement Section for a very long time and they produced a sampling system for measuring the pulse and bar using a sine-squared pulse as the means of chopping out the noise band which you measure; this is still the standard system for measurement, but it seems fair to classify them all under the pulse and bar method. We ought to record the fact that the television service closed down on the outbreak of war with Mickey Mouse at Alexandra Palace and we started, after the war, with a most appropriate item, a harp recital. Soon after the coronation, television began to get ambitious about new types of programme, where the techniques affected very much what could be done, especially things like flying in aeroplanes etc. So Designs Department was the home for a new unit called the Experimental OB Team, where we had some of our own staff and a co-opted member of the O&M staff. We did the necessary work to do these particular types of OB. The first one was from aircraft and we did a deal with the RAF to install television equipment in the plane. We gave them the results of what we did as a ‘quid pro quo’ for what they did in making flight time available to us and a programme of work examining the problems started right away. The first flying OB was, I think, in 1954 from a ‘Varsity aircraft, where we did various RAF type manoeuvres, such as landing through fog. It was a real fog that we did it through, too, a vicious night! We also, of course, examined the propagation problems of how to get the signal from the aeroplane to ground; we started off on 200 MHz, which is what we had available, though later on in our experience, about a year or so later, we began to have UHF frequency-modulated equipment and we found that was far superior. The second OB that we did was from a submarine. We really jibbed at that one; all we could do was put an aerial on the submarine itself, so when it was submerged we lost the signal. We did talk about towing a buoy from the submarine but the Navy weren’t at all pleased about this idea, so we had to settle for the aerial on the submarine. It did mean that we had to look at the problems of getting equipment into confined spaces. The next, after that, was helicopters; again we were still using VHF with amplitude-modulated signals and we had to do work on the receiver to deal with rotor flutter and we got very acceptable results from that. Meanwhile, along with all of this, we began to learn the problems of the type of equipment that we ought to have. All we had was old fashioned mains-driven stuff, and we began to produce power supplies to run straight off aircraft supplies etc. Nowadays, with solid-state stuff, it’s a pushover, you can almost run it from a dry battery which has very much eased the problems. The problem of rotor flutter disappeared entirely with the change to UHF working; all our link stuff is on frequency-modulated signals and these problems, which at the time were difficult, have now disappeared. The OB team lasted about four years, with first Larkby in charge. Austin was in charge for a short while but we soon deflected him on to other work and put Moon in charge to do the later series of very arduous helicopter OBs doing things like flying round the Forth Bridge, flying with the Navy. Immediately after the coronation there arose a need for a mobile camera on a vehicle which, after various names, got called the ‘Roving Eye’. The first one was constructed in Broadcasting House car park and comprised an Austin van in which a camera was mounted in a gun ring in the roof, with a petrol-electric set inside, complete with a camera channel and sound equipment, including a sound transmitter on the VHF band so that pictures and sound could be given from a moving vehicle to base. This was very successful; the ranges that we were able to obtain were quite appreciable – a mile or two even in built-up areas in central London, and it had quite a lot of use. In fact, two years later we were invited to do another one which had two cameras and at that time we also changed to a UHF link which, of course, from the propagation point of view, was better in that we used FM but worse in the choice of frequency, but we had no choice – we had to clear out of the VHF band. This lasted for a long time; it was a very powerful tool. On both these vehicles we used aerial stabilisation of bearing; we were using a gyro-compass to keep the aerial on bearing, the setting of the bearing being done in the van manually. This setting would be held regardless of the gyrations of the vehicle – this we found to be absolutely vital even if you think you know where the receiving site is, you have to hold the aerial automatically. The expert on all this was Geoff Larkby who designed both of these Roving Eyes and constructed them. That kind of era has tended to disappear – the era of the special pioneering kind of OB has largely gone, but we still have roving eyes which are real descendants of these early ones. The latest one in fact is mounted on a Citroen ‘Safari’ body; we have just finished making that. It has a single colour camera with the appropriate transmitting equipment which, once again, is Designs Department UHF equipment. They have recently designed and produced a new UHF solid-state starting link like the type we described earlier. At coronation time, as I mentioned earlier, we had a rather elementary system of locking up many sources so that they were synchronous at the mixing point. This was done by radiating a sine-wave from the central point with an old fashioned goniometer type of phase shifter steering them into synchronism. Work went on from time to time on more automatic methods and I suppose the next phase was the constant line number locking system which in effect compared the 50 Hz element in the two wave forms and steered one of them into step with the other automatically. It wasn’t bad, though a bit elementary and there were problems of the feedback which were not very amenable to simple solution. You could lock up one source to another but that was about the limit. It has only just come out of use for tying up permanent things like Lime Grove and Television Centre where it was going to stay put, but it didn’t find much favour in general use because it was a bit ‘edgy’. Then about 1965 Bliss came forward with his ‘Natlock’ proposal which was a very elegant method and very sophisticated, of steering the sources into synchronism, whereby the feedback signal from the error between the two sources which you wanted to synchronise was in the form of a very simple digital code which could be transmitted over narrow band circuits and things could be pulled into synchronism indeed. It relied on the fact that you could start off with a good crystal, so that your frequencies which you were trying to make the same were known to be fairly close to start with. The assumption is that you can get a good crystal to within 1 in 106 for a moderate price. You use your mixing-point crystal as reference and then just send corrective information to pull them in so that at your mixing point the sources are in synchronism. It had two modes; one was a fast-pull-in mode in which the correcting signals were strong, and which operated when the error was large until it got to within about 8 µsec of synchronism, when it would change to the other mode where it would steer itself in very gently. Having got itself in, it would stay put for very considerable periods. I might just add that the real reason why you have to adopt these rather sophisticated techniques is that your master oscillator at the Centre must not be changed very quickly, otherwise you upset particular machinery with large inertia-like video tape recording machinery which may effectively fall out of synchronisation and produce a travelling bar on the picture. This system allows you to look up as many external sources as you care to provide feedback circuits to because it’s the far source that is brought back into synchronisation, not the single reference point at the receiving end, so you can have half a dozen if you like, and as far away as you like, or at any rate up to 2000 miles loop circuit. This is not a negligible factor because it means that it is difficult to lock up America. You only need about a 1—Baud circuit for the purpose – a 50 Baud circuit would do really. You can use it in either mode, you can switch it so that it can pull in the local source rather than the remote one, which requires less feedback information, in fact the feedback is local. The biggest hook up we have done so far, I think, was the Caernarvon Investiture programme; all the sources there were held in synchronism with Natlock, and the Commonwealth Games had all the sources held by Natlock, also the whole of the complex here in West London. While we are just on this subject, all the local sources here are held in phase synchronism by a simplified version of the Natlock system, in other words a distant source, and in terms of electrical delay even within the Centre they get appreciably distant, is automatically brought into synchronisation by this simplified version. This doesn’t mean that we have completely abandoned the old fashioned ‘Genlock’ which was a more rapid device for bringing in the local generator into synchronisation with something coming in. We do use that as well because of its high speed of operation; we can quickly change, but when we do, we have to be very careful to use a synchronising generator which is not running anything more than is absolutely imperative from the point of view of that single programme. In other words the rest of the Television Centre will go off on to another waveform generator as far as possible; it’s not always possible to achieve it, but we try to. This has now been extended to operate on colour, so we now have colour Natlock and this means holding the colour carrier to a phase accuracy of a degree or two, which is really a high precision device (T Worswick: about a second in your lifetime, John – this kind of accuracy). Natlock of course derives from ‘National lock’ – anywhere in the nation and Genlock is generator lock – local generator lock. Cable film was developed to provide a facility for news inserts from distant parts of the world. At the time when the first transatlantic telephone cable was laid, it became a requirement to get news material from the North American Continent and, looking further ahead, we were thinking in terms of Australia and New Zealand, to which at that time the cable was planned to be extended and has in fact since then been extended. A film at the sending end was put through a low speed film scanner or telecine; the bandwidth of the channel connecting the sending and receiving ends was about 6 kHz i.e. about two voice channels in the transatlantic telephone cable. The signal was decoded at the receiving end and displayed on a picture monitor with a very long decay time phosphor and photographed on another film camera. The film was then developed and the insert was then available. The time elongation, or reduction, depending on which way you look at it, was about 100 minutes transmission for one minute of film for programme (i.e. a cable transmission time to programme transmitted time of 100 to 1). Its main disadvantage was the requirement for pretty well perfect transmission for a long time in order to achieve a very short time of end result, so that it was very liable to interference. It had two film processes in cascade which is not a very good start. But it was used, though its continuing development was overtaken by the arrival of satellite transmission, the first of which was ‘Telstar’, in the late fifties, succeeded by one type of satellite after the other, finishing with the synchronous type, which provides circuits at all times from most parts of the world’s surface. You will have already had an account of the first OB from outside the United Kingdom from Calais, from Tony Bridgewater. The next was from Paris, which was a variety type of programme, with visits to various places and was the first occasion on which a standards converter, capable of changing a television signal from one line standard to a second line standard was available. This converter worked on the principle of displaying the picture on the incoming standard and re-taking the picture on a camera on the desired receiving standard. I think it was a three inch image orthicon camera at the time. The standards converter had a display of which the decay constant had been carefully chosen by the designer of this apparatus, Val Lord, in Research Department, and the camera was set up to give the best kind of picture you could produce. This equipment was taken to Cassel in France, the signal was conveyed to Cassel by the French and thereafter, after conversion to 405 lines from its original 819 lines, it was transmitted to London on temporary circuits by the BBC. Subsequently, Designs Department developed and manufactured a more professional type of equipment, a main and a standby, based on the same image principle, which was installed at Swingate, and this installation was built up eventually to provide not only conversion of incoming signals, but also outgoing signals from any European standard to any other one. Eventually, permanent circuits became available between Swingate and London and the conversion equipment at Swingate was transferred to the Television Centre where it remained in service for some time. Immediately before the arrival of the solid state electronic type of standards converter Designs Department produced yet another type of standards converter, more precise and needing less attention. This was an optical standards converter based on a 4.5 inch image orthicon camera which again was capable of conversion in all combinations of standards. There was also a field standards converter developed by Research Department for converting standards between signals on different field scanning rates, 50 to 60 Hz conversion. This was based on a cps Emitron with a stabilising pulse displayed in the picture to enable the flicker which inevitably results from the beat between the 50 Hz and 60 Hz frequencies – the 10 Hz flicker to be controlled automatically and reduced to a point at which it was virtually imperceptible. At about the same time, the Fernseh Company of Germany produced a field standards converter based on a very high intensity display and a vidicon pick-up tube, of which we bought one or two. This is our sole remaining image type converter which we keep as a reserve for two things: for converting pictures on different field frequencies should our main electronic type fail and for doing the odd (and now very occasional) 819 line transmission; the French are now discussing a change to 625 line transmission on their chain 1. The development of the electronic type of standards converter began about 1960. It was produced because it had been realised that the forthcoming development of new television programmes, or additional television programmes in this country was going to employ the 625 line scanning standard, leaving the two existing programmes on 405 lines, at least for some time to come. It was clearly necessary to provide a converter system between the 625 line and the 405 line standards if we were to have any flexibility at all in the use of picture-producing resources. Obviously, everyone was looking forward to the day when we would generate everything on 625 lines and be able to derive from that a picture in the 405 line version. 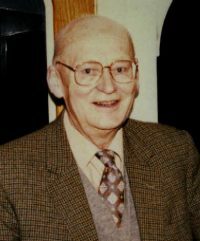 This realisation led to a period of thinking in Designs Department from which resulted the suggestion, by Peter Rainger, of a new method of electronic standards conversion. (There are plenty of papers on this development). It essentially consists of dividing the picture up into vertical strips, each representing a picture element in the horizontal direction, and you store each of these vertical strips in a filter or capacitor or something of that nature for as long as is necessary to sample the information at the new outgoing desired standard. This led to the development of the first line store standards converters, so called because they store the information for the duration of about a line. These devices are now in use in very large numbers all over the BBC network, and the ITA network as well. They are stationed mainly I think at transmitting stations where the 625 line signal is converted to 405 for the appropriate transmitters. Going on from the line store standards converter, it was of course appreciated that the next requirement would be for a field store standards converter, moreover one which would work in colour, because the future of colour, by the time we got round to thinking about this problem, was already decided, both on the continent and into this country, it had already been going in the US for some years. Two ideas were generated almost simultaneously within a matter of weeks. One in Designs Department for a relatively simple kind of field store standards converter. The other a very much more sophisticated type of equipment in research Department. Both of these devices were based upon the use of electrical storage extending over a period of about a field of the television signal. In fact they use quartz delay lines which had been developed in the US in connection with some defence requirement and this is what is being used at the present time. The Designs Department’s field store standards converter was produced in time for the opening of the colour television service of the BBC; indeed rather before the opening of the official service during the so-called launching period of the colour service, which would be about June of 1967. It had a number of disadvantages but nevertheless it did convert the pictures from one standard to the other with very good quality, although with some loss of picture information – the picture was slightly smaller than the standard size – and this was available for converting from the American standard on 525 lines to the European standard on 625 lines. We still have those; they act as reserves to the Research Department field store standards converter which is now available and in use; one machine working from the American to the European and the other from the European to the American standards. This is, perhaps, the most elaborate analogue type piece of television equipment ever built or ever likely to be built, because it is an extremely complicated device (many papers exist which describe this device in detail) but excellent. They are becoming more and more reliable and need less and less attention from staff. I have no doubt that we are going to move in due course into standards conversion using digital techniques; the first of the line store type of converters using digital techniques was demonstrated only two or three weeks ago and seemed extremely promising; it was a very remarkable device. This is a joint development by Research and Designs Departments. Eventually, no doubt, we shall move into the development of the digital field store converter, because the analogue type requires extreme precision of performance. The main reason for going to digital conversion is to avoid this necessity for precision where delay lines are used, which inevitably have echoes in them which affect an ordinary analogue signal, whereas a digital signal could utterly ignore them, provided they were perhaps not more than half the amplitude of the wanted signal. On the audio side, automatic monitoring i.e. machinery for judging the quality of a sound circuit or a sound programme has been developed for some time. In recent years similar techniques have been started to be applied to television, but in the last two or three years it has had considerably more emphasis and impetus applied to it because, with the development of the Television Service in the UHF band, where we are literally going to have tens and hundreds of transmitters, these transmitters have to run unattended. There is no possibility of being able to afford to have staff on the stations so we have had to devise machinery which will keep them in good order and check that the programme is going out in good order and only send alarms for people to come and help and mend things if the programme is technically not satisfactory; so that this, especially on the television side, has taken on a very new slant. Television monitoring is based on the assumption that a test signal is applied at a programme source, typically in BBC case the Television Centre. In the field blanking of the television wave form this test signal is known to be of good quality at the point of junction with the programme , so that as long as this signal is known to be in good order the programme itself should be in good order as well. A new range of monitoring and control devices has been produced on this assumption, which can do two things: it can measure the amount of distortion on the wave form and with respect to certain parameters it can correct the distortions; certain parameters we think it justified to correct for, others we think it not reasonable or not economic to correct for; but we send alarm signals for help or for men to look into the matter if things are getting outside limits. The main device for this is the new television automatic monitor major, which can measure no less than twelve parameters of the television signal and assess whether the signal is in good order. There are quite a number of these automatic correction devices in service already, and by early 1971 there will be a total of fourteen television transmitters entirely unattended; there will no staff whatever and by the end of 1971 there should be about fifty transmitters entirely unattended keeping themselves running in good order. Most of the history of monitoring is of course on the audio side. This was started quite soon after the formation of Designs Department, indeed it was one of the reasons advanced for starting that Department. It was Peachey who began work in this field and produced what was facetiously known throughout the BBC as the “tin TA”. The thing in fact worked extremely well; it gave a lot of alarms. But I think the plain fact was that it rightly gave a lot of alarms and tended, as a consequence, to fall slightly into disfavour, but it nevertheless had a very important influence on the policy of Engineering Division in staffing various facilities here and there outside the main studio centres. It was of course used largely at the transmitting stations. The development of this was completed by, I think, the early fifties and then there was a bit of a lull on monitoring until once again Peachey took up the problem in relation to sound because new techniques had been evolved and new apparatus was called for, in about 1960, redesigning both the sound automatic monitor and making a start on the television automatic monitor which Tom has already described. It has been through a number of vicissitudes; there have been a large number of different types of television automatic monitor produced but now we are getting down to this fundamental principle that you add a test signal to the wave form from which you can determine whether as a consequence of transmission anything deleterious has happened to the picture. The question of where the alarm sounds has not yet been finally resolved. One would imagine that there would be a system of parent stations where, for other reasons, there is probably a man and the thing would report back to that; but the geography of the country and the planning hasn’t made that very tidy. For example, in some of our cases the parent station which it is convenient to report to is not very convenient from the point of view of the man going to deal with it. Hannington is on Rowridge, but the report goes back to Oxford which is rather tiresome. This has got to be sorted out and we shall have to come to some fairly coherent plan for the controlling station to be sensibly placed, geographically, with respect to the man who has to go to the offending station. The method of sending the alarm varies; sometimes it is on 23 kHz on the sound carrier and in some cases it’s the automatic fault report or the TIP that we have to use. The first work on colour television was carried out by Research Department many, many years ago. I remember seeing the first demonstration at Kingswood Warren just after they had gone there, whenever that was, which must have been about 1948 or so. They had their pin wheel colour television, a rotating colour disk with an iconoscope pick-up camera and they illuminated a number of subjects. The illumination needed was so enormous that I don’t think anybody could have ever sat in the illumination; it was much too intense. No doubt, however, they learned a very great deal about colorimetry and television lighting as a result of those early experiments. The next move in colour television occurred in America where another colour disk system, proposed by CBS, was actually adopted as the American standard system for a little while – it was adopted in 1951 – and looking back, it seems almost incredible that it should have been adopted so soon after the introduction of television itself in America. It very quickly generated a great deal of opposition in the States as it was realised that this was a system likely to be a handicap rather than a benefit because it was not compatible – you could not get a black and white picture from this system on an existing standard receiver – and it used more bandwidth than was thought to be available – more bandwidth than the standard black and white system. This opposition to the system, led by RCA, eventually led, in turn, to the setting up of the NTSC and this Committee, as the result of an immense collaborative and intensive effort, in 1952 produced its report and in 1953 the NTSC system was adopted as the standard for future colour transmissions in the United States. The service in the States, I think I’m right in saying, started on January 1, 1954. This work, of course, was reported all over the world. The NTSC system was naturally thought to be the last word in colour television systems. We here in this country took an interest in it from the very earliest publication of the details of its parameters. Designs Department started work to knock together an elementary version of this system about 1954. At the same time the Marconi Company who had been working on colour television, I suspect for about two years prior to that under Jesty, produced a complete version of the NTSC system modified for 405 lines, which consisted of the wave form generator together with picture monitors. They had two types, one based on the shadow mask tube (15”) which was the biggest version of that tube available at the time and also a back projection type of colour monitor using three separate scanning tubes which were optically combined to project a picture on to a screen. At the same time they were working on a two-tube type of colour television camera, as compared with the three tube camera which was being used in the States, the latter employing 3” image orthicons. Just to complete the camera story, the two tube version continued to be put forward by Marconis until such time as we in the BBC had acquired some three tube cameras about which I’ll speak later, and we could compare the results with our three tube camera against the proposed two tube camera. To go back a little, having been invited and having seen a demonstration of the apparatus which Marconis had got and being very impressed indeed with the quality of the pictures from slides and films, although we admitted that we were not at all impressed by the quality of the pictures from the camera, we could see the potentialities of the system. In some way or other, we invited Marconis to collaborate with us in experimental transmissions just to see how the system could be handled. They brought their equipment to our labs at Western House and we took pictures from slides and a 6 mm film scanner. We took the opportunity to make tests on the robustness of the signal from the point of view of transmission. We sent the signal to Alexandra Palace over the then existing black and white circuits – of course we had no colour circuits at the time – and radiated it from the standby 5 kW medium power transmitter – the same type that we used at all our medium power VHF stations at the time – modified to send not quite the peak power. We used about 2 kW rather than 5 kW. We also sent the signal all round the SB system, up to Manchester and back. We did not possess a decoder having a locally locked sub-carrier oscillator derived from the burst. So in order to demodulate the signal after its journey to Manchester and back we used the same colour sub-carrier at the receiving end as that which was used to form the chrominance signal. We used the local sub-carrier just wired across from one bay to the other while the picture went right round the loop, but surprisingly the picture was remarkably stable. It would stop in phase synchronism for minutes at a time and when it moved it moved very slowly; there was no jitter at any time. They were all cable circuits; there was no radio in the circuits in those days. This was a remarkable eye opener to us, how stable the SB system was on the one hand, and on the other how manageable the NTSC system was in itself, in that you could inject the local carrier. We did of course receive the signal back from Alexandra Palace on a radio receiver, which Marconis possessed, with decoder and everything, and those were the earliest experiments on colour television. In normal reception of course any phase shift during transmission applies equally to the burst and chrominance information, so that the absolute phase rotation produced by transmission is of no consequence. In the case of this hook-up, however, we were relying upon the phase stability of the long circuit to Manchester and back since we had no means of altering the local colour sub-carrier except manually and of course very slowly. This rather elementary experiment, however, convinced us of the practicability of the NTSC system as such since these black and white circuits, all on cable incidentally, produced pictures which were, to our eyes, insignificantly degraded by transmission over the circuit. In addition to the knowledge we obtained of the remarkable stability of the cable circuits we were also surprised by the lack of impairment of the colour picture due to differential phase and amplitude. It is true to say that this experiment fired us with enthusiasm for the NTSC system of colour television. The main object of our visit was to establish for ourselves, by examining American colour installations, of which there was only one complete, the complete one being at the Colonial Theatre in New York City. There were a number of installations busily being put in at the time both by NBC and CBS, in New York and in Hollywood, in Los Angeles. Our main object was to establish that the planned space for apparatus at the then busily developing Television Centre was in fact quite adequate for colour equipment and not just for the black and white equipment on which the plans had been based. So we went off and formed our opinion; we sent a cable back to McLean saying “All OK, there’s plenty of room in the Television Centre for the colour equipment”, which in fact at that time was all valves. Thank goodness we changed to solid state between then and now, because I doubt if there would have been room! Nevertheless, we thought there was room enough. When we got back McLean formed an experimental colour group because he thought it needed progressing – we had of course also been looking at the production of colour programmes in the States. I was lucky enough to be put in charge of this and we had O & M chaps in it and programme people. Roughly it consisted of myself on the technical side, supported by Tony Stanley, Ken Howe, Eric Spain on the programme side, Ian Attkins the principal producer of the time, Maureen Winslade the make-up expert, John Treays our lighting expert (now one of our technical managers), Barry Learoyd. We set up an experimental colour studio in the old studio ‘A’, the original black and white television studio with very much the same facilities in the studio that it had had previously. We had a 16 mm film scanner designed by Research Department and one colour studio camera, a 3 inch image orthicon camera made by the Marconi Company, based very closely indeed upon the RCA camera. We set up a series of programmes with these two cameras. In fact we did one programme and radiated it during the visit of the CCIR, which had also set up a working party to determine what colour television system would be used in Europe. This programme was demonstrated at Kingswood Warren, just employing a single colour television camera which was all we and at the time; that must have been in 1955. When we got the two cameras we did a series of programmes, covering the whole gamut; cookery, drama, variety etc., radiated after the main BBC television service had closed down at about 11.30 pm or so. They were observed by people who had colour television receivers and sent in completed questionnaires covering various aspects of the colour accuracy, picture sharpness etc. From this we did an analysis which showed that the picture quality as assessed then was adequate for a public television service and, in particular, we all felt that the system as such was very good, though the picture quality that we were getting was limited by the performance of the camera and the receivers. We did a second series of programmes after an interval of a few months, really only to keep our hands in because we were expecting that we would move into colour television within a very reasonable period, perhaps about a year or two. In fact, the Government decided that the time was not ripe for colour television and we more or less closed down the experimental colour team at Alexandra Palace and moved the film scanners, which by that time consisted of the Research Department’s 16 mm and the Cintel 35 mm film scanner, to Lime Grove and installed them there and kept up, for the benefit of the industry, a regular series of radiations in daytime of colour films and colour slides. I don’t think, in fact, that we had any significantly long intervals when we didn’t radiate experimental colour pictures. The industry were, of course, continuing to develop colour television receivers and keep their eye on what was happening in the United States where there was a regular service which was progressing steadily. Eventually we set up another studio in Lime Grove, studio ‘H’ round about 1962, in order to provide tests for experience again in view of the European interest in the choice of a colour television system which had led in turn to the setting up of the EBU ‘ad hoc’ group on colour television. This group in due course produced two very long reports in which it itself failed entirely to make a unanimous recommendation as to which colour television system should be adopted. In the end the CCIR, as we all know, also failed to recommend one system, and we all went off, some of us adopting PAL, while the French adopted SECAM, the Russians nominally also adopting SECAM. During the battle for the system, the BBC was extremely active in the practical sense and towards the end of 1964 we took a complete equipment including receivers, decoding equipment and displays to Moscow to demonstrate long distance transmission of NTSC from London to Moscow right across the Eurovision and Intervision network. We came back for Christmas and went again early in 1965 to demonstrate the use of the pilot tone system for correction of distortions on long distance transmission links which might occur on the NTSC signal; this was a proposal of Dr Lewis’s which was instrumented at great speed in Designs Department and we certainly took it to Moscow to demonstrate. We tested, in the Soviet Union itself, a number of looped circuits which they handed over to us. We didn’t know where they went to; they just said “That’s the outgoing circuit and that’s the return circuit”. We demonstrated this in competition with the SECAM system which was, at that time, also in the Soviet Union with French engineers looking after it. We took complete coding equipment for that; we had a Cintel slide scanner in Moscow as a source of pictures. Cintel took this along and RCA were there too. I remember giving a demonstration to the assembled company, including Ministers, which was very embarrassing and made me fear for my sojourn in the Soviet Union – I might have been going further east, I feared – because in fact we failed to give any kind of demonstration at all! The link in, of all places, the United Kingdom failed to get the signal to the coast! Very fortunately, we were able to make it all work the next day and gave a very successful demonstration. From London we sent all three systems, SECAM, PAL and NTSC – NTSC with and without the special correcting device. This all arose because Novakovsky, who is a well known Russian engineer or scientist, got in touch with McLean and asked him to come over and demonstrate the virtues of NTSC, and it all flowed from that. As it happened at the time, the Soviet Union had already signed an agreement with France to adopt the SECAM system and we were rather beating the air; of course we knew nothing about that at the time. The effort we put in was really enormous because all this equipment had to be flown over to the Soviet Union. It was always a tremendous effort to get anything there and back again, especially as, during the second visit, we were rather unwelcome because of the presence of the French engineers who were working in the television centre there. That was one very interesting part of our very long effort in providing apparatus of all kinds for this EBU study, combined with subjective tests ad nauseam and giving results and papers etc. Having finished up with two systems in Europe, SECAM and PAL, there was inevitably the knock-on, the need for transcoding, because whether we liked it or not, we would take some French programmes; so, once again, the BBC set to and we made the appropriate transcoders to go from SECAM to PAL and, in fact, we have now made one to go the other way also, but in essence all we do is decode from one system down to R,G, B or ‘sort of’, and back into the other – it’s a bit more subtle than that, but in essence that’s all it is and the degradation isn’t too bad. The BBC’s colour television service started in June 1967 with the so-called launching service. The first major programme we undertook, and it was a major programme, was Wimbledon in colour in June 1967. This gave us some twenty or thirty hours of television programme during the first week when the launching service went on air, and BBC 2 progressively added more and more colour during the whole of this period after June, until in fact the service started in November 1967 when BBC 2 went wholly into colour, with small exceptions. BBC 2 was joined by BBC 1 in December 1969 together with ITA. I visited Khartoum to give the Arabs a talk about colour television and wrote a paper in that connection, copy of which I will give you now. There is another story which is archival in nature, concerning the colour television system known as SECAM 4 or alternatively NIIR. It was given both those names in the course of its brief existence. I think you will find it referred to as SECAM in the official CCIR documents. This system was proposed very late in the investigation into colour television systems by the Soviet Union, and it was proposed, one imagines, as an attempt to achieve a compromise between PAL and SECAM. My recollection of the date at which it appeared was round about November/December 1965. We received details of the system by underground channels – we had no official communication because it was kept rather a close secret between the French and the Soviet engineers. The details, very briefly, are that it sends picture information on one line and on the next line there is a reference sub-carrier and so on and so on down the picture. The idea behind it being that any distortion which was associated with transmission of any kind, and that included everything: recording, sending over long distance circuits and broadcasting from the transmitters, would also be suffered by the pilot reference. This made a very simple receiver because you could use the pilot reference which was there for a long period, half the total time, as your demodulating carrier. You didn’t have to send any bursts or anything of that kind. This system appeared to be so interesting that we knocked it together very rapidly in Designs Department and explored its potentialities and it seemed to have quite a number. There was no doubt about it, it was a relatively promising system. Just to complete this piece of political history, the BBC tried very hard to get it considered very seriously at the Plenary CCIR meeting in Oslo in 1965 but in fact, in the end, it was discarded because none of the delegations could agree to adopt it. The very interesting thing about this is that exactly the same system had been proposed by an engineer in Television O & M a year or so before the advent of this system. He had worked it out from theoretical grounds and the circuit development which he proposed to use was precisely the same as that which was eventually put forward by the Soviet Union. This was a very remarkable achievement because it was really a unique system of colour television transmission. He submitted this paper to Designs Department at least, and I suspect also to Research Department, and it came to us for consideration and while we said, or if you like I said, that it was a very promising system, there would be little point in putting forward a fourth television system at this stage because we already had the three competing systems – NTSC, SECAM and PAL. Accordingly the system was not published in advance of the proposition by the Russians. This was subsequently put right by a letter I wrote to the ‘Wireless World in which I pointed out that this had happened and that we could produce the original documents showing that the idea was prior to that of the Russians. Whether there was any connection between Pethers’ ideas and the proposition by the Russians who can say? There might well have been, because Pethers undoubtedly talked to a number of engineers in this country who in turn may well have had contact with the Russian engineers. So when people say “Why didn’t the British invent a system of colour television?” the plain answer is that they did, but it was suppressed, I think on good grounds at the time. It offered no great advantages over any of the others that we could see and at that time we in Britain still thought that it would be to the advantage of Europe to adopt the NTSC system rather than any of the others that were being proposed. In fact, I think it is quite true to say that the PAL system is technically superior to the SECAM 4 system – not tremendously so, but significantly so. So had there been a technical decision taken on proper engineering grounds the PAL system would still have come out on top. The name was Brian Pethers*.